Here is a master of contradiction in its true sense, a composer that creates musical harmony out of chaos. Closed to Distantly seems to be a perfect name for an album made out of a forum filled with necessary and twisted opposites – an environment that we call life. It´s not so AbSUrd after all. DEAD: So, who is “AbSUrd.”? Could you give us some background regarding who you are and your present life? AbSUrd. : A musician from the northeast of France… living on a woody hill where the grey tones of the city threaten the distant mountains. 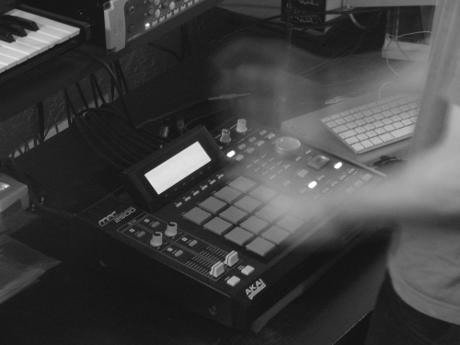 I started making beats with a MPC in 2006 at a very dark time in my life. The need to create was necessary to maintain a solid look to the horizon. My first solo album was released in September with talented artists such as Babel Fishh, Bleubird, Ceschi Ramos, James P Honey, Reindeer and Papervehicle… Since 2007 I also blow disorientating winds for the group Murmur Breeze with the English vocalist/MC James P Honey… We already have two albums together. DEAD: What are your influences and inspiration in music and in life? Any other passions besides music? AbSUrd. : My influences are vast, I’d even say unlimited. Each particularity or detail of this life is a source of inspiration and additional questions… I’ll never see the end… There’s so much to see, so much to do. Art in every form passions me, trips into uncharted lands, mythology, conspiracies, the world drowning into itself… To learn and to discover always more are enthralling occupations for a sailor observing the unknown with telescopic glasses. DEAD: Would you mind sharing your creative process with us? AbSUrd. : Not at all, absolutely! But maybe this will be boring for you! The process is really simple; I only compose at night to absorb the silence necessary for an absolute focus which opens the doors of my imagination. Most of the time, I begin to search for a melody… the days humour or the last weeks often characterize the atmosphere of departure. Then I mechanize some rhythms tapped by the hands and I allow myself to be guided freely between unconsciousness and consciousness. It’s a most indescribable and fascinating sense. DEAD: How would you describe your music? Is it possible to put it in a particular genre? AbSUrd. : I’ve never been able to answer that question; I don’t know what to say except for the name I gave myself. But is it a musical style?! DEAD: How did you hook up with the guys at decorative stamp? It is an immense honor to be a part of this stable because Decorative Stamp abounds in exceptional artists. AbSUrd. : Everything surely started with the first album of Murmur Breeze called “Bird Irony”. This record was embryonic and we didn’t want to present it to an official label. In the same period, James P Honey also recorded an album with James Reindeer “Rough Tongues Surface”. The question was certainly suggested at this precise moment for them I think… While the second album “Foreshore Reverie” was under construction, we gathered with both James’ in France (they measured the European territories on tour in 2009). I was naturally invited to join ranks when the announcement of a solo album in works came to their ears. It is an immense honor to be a part of this stable because Decorative Stamp abounds in exceptional artists. DEAD: “Close to Distantly” is your solo debut. What made you decide that it was time to release it now? AbSUrd. : I started this solo album at the end of 2007… It’s connected with profoundly striking events of my existence. It needed a consequent time of reflection to find coherence between the wounds of past and the envy to move forward in spite of sneaky questionings. In brief, it was the moment to release “Close to Distantly” because it had the enough time for maturing or simply hatching with all its uncertainties and contradictions. DEAD: How come you didn’t decide to do an entirely instrumental album and, how come you ended up working with the ones you did on the album? AbSUrd. : I decided not to limit myself to only instrumentals because I was blessed enough to meet all the astonishing MCs that are featured throughout the album when I used to organize shows in Nancy (France) or when Myspace was still the place to be. The desire to work with most of them was the fuel that made me go forward, the energy that made me push the boundaries. Collaborating with masters such as P Honey, Reindeer, Ceschi, Babel Fishh, Bleubird, the Papervehicle and Filkoe is such a reward for my works. Once the songs were recorded, how could I let them rot inside of a computer?! DEAD: In comparison, what do you prefer, working on your own or with others? What do you gain and/or miss out on when you compare the two ways of working? AbSUrd. : There are no preferences for the one or the other… Both provoke variable trances close to the point of no return in me. My next solo album will be certainly instrumental or almost because I already visualize it in a corner of my skull since a long while now, but I do not intend for one second to stop the writing for the others. Those are very different methods of conception which have each a growing interest. The main challenge with the instrumental album will be to become the unique narrator. DEAD: Did you have a say in when it came to the lyrics and topics presented on the album? AbSUrd. : No, not at all, the vocal guests are free to write whatever matter of ideas crossing their brains but it sometimes happens that the writing is influenced by the original titles of songs that I name before sending them. DEAD: When listening to the album I got strong vibes both of oriental influences and of watching old black and white silent movies. Am I totally way off, or are these things that you yourself have been inspired by while making the record? AbSUrd. : The oriental influences have inspired me for a long time but I have never visited Asia or any part of the orient. There’s a sense of wiseness and peace in their music that has never quite found any other equivalent. Follower of theory of the just medium myself, I sometimes draw some roots from their knowledge indeed. The large amount of documentaries or old movies that I viewed influenced maybe more than I would have thought of, but wanting to propose a singular and full of imagery music, I am really proud to send you particular flashes at home. DEAD: What kind of response has the album got so far? This interview is the perfect opportunity to thank everybody who supports my music. AbSUrd. : I regularly receive emails with encouraging and deep words; I also read some surprisingly positive reviews on my works. This interview is the perfect opportunity to thank everybody who supports my music. Thanks so very much to them. DEAD: Are there any upcoming projects, and what are your hopes for the future? An avalanche of gratitude for Dead Magazine. Find peace in a sick world.